BarkBox! Bark! Bark! Bark! Love it! I couldn't have named it better myself! BOL! What's inside this wonderful box is even better than the name! It has stuff like treats and toys inside! High Paw! 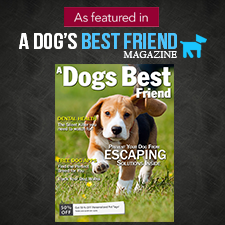 An extra perk: BarkBox donates 10% of proceeds to rescues & shelters. I am the Small & Cute size! Do you want to see what is in my November BarkBox? Let's open it up and sniff what I got! I don't have to share, do I? This is all for me, right? This is a pawsome holiday gift! OMD! Look at all of the goodies inside! I was told the treats would all be natural and made in the USA or Canada. Let's see if that's true. I see sausages, Mac n' Cheese, a toy, dental bones, and a crunchy venison chew stick! Let me taste some of those treats! I want to eat the sausages first! These all natural turkey sausages are from Happy Howie's. They are made in the USA, and don't contain any corn, wheat, soy, artificial color, artificial flavor, or artificial preservatives. There are 5 links in the package. Yum! I gobbled up that turkey sausage as fast as I could! Can you believe Mom made me give one to Baron? I told her I didn't want to share! Ingredients: Turkey, rice flour, sodium lactate, salt, sugar, garlic, preserved with (cultured dextrose, citric acid, and mixed tocopherols), vegetable oil, and rosemary extract. OMD!! The bag is pink and says cheese! They must have picked these out especially for me! These are Truffle Mac & Cheese biscuits from Bocce's Bakery. 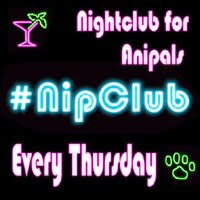 (I've seen this company on Twitter! @BoccesBakery Guess who else is on Twitter - @barkbox ) These all natural biscuits are made in the USA, with all USA ingredients! The bag says they only have 4 ingredients and are extra cheesy. That sounds delicious to me! Let me sink my teeth into one. Yummy! They are cheesy! Darn it, Mom gave one of these to Baron too! What part of "I don't want to share" does she not understand? Ingredients: organic barley flour, part-skim cheese, turkey bacon, and truffle oil. Bocce's Bakery Mac & Cheese biscuits contain no wheat, and no preservatives. This Zucchini from P.L.A.Y. isn't for eating, it's a squeaky toy meant for playing! It works for both fetch and tug, 2 of my favorite games! (Remember - I am a small & gentle dog, my tug won't rip a toy in half.) My Zucchini toy came with a recipe for Zucchini cupcakes printed on its tag. I wonder if the recipe is for humans or dogs? BOL! Mom thinks it's for dogs since it uses whole wheat flour. Maybe I will send them a tweet to ask who the cupcake recipe is for. (I've seen tweets from this company too! @petplaysf ) My BarkBox included a $15 off of $75 purchase coupon for P.L.A.Y. There are 2 vanilla mint bones in my pack. 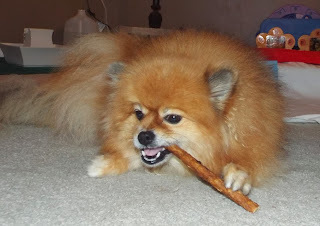 My pack of Pearly Whites bones are just the right size for me - size small for 5-15 lbs dogs. This natural chew is made in the USA. Ingredients: Rice flour, gelatin, vegetable glycerin, water, cellulose, garlic powder, calcium carbonate, peppermint oil, and vanilla. After all of the forced sharing, I decided to run off with my prize. I took my bone out of Mom's sight. Then I was able to enjoy my tasty dental chew, without a camera in my face. Mom didn't steal one to give to Baron this time! BOL! I guess old humans can learn new tricks. The last treat in my BarkBox is a Crunchy Deer Chew from Etta Says! This 7 inch chew is made in the USA. It had a small label, so it didn't have an ingredient list. I enjoyed my chew, but there was something that I didn't know at the time. I know you expect me to list treat ingredients, so I looked them up on the Etta Says! website. I was very surprised by the first ingredient on the list. Ingredients: Rawhide, deer, natural caramel color, and salt. I never expected to see rawhide on the list because it is a BarkBox policy to avoid rawhide. I have always avoided rawhide, and will continue to do so. I don't blame BarkBox, I myself was tricked by the insufficient label from Etta Says! I am ashamed that Mom didn't look up the list first. She's gotten so used to chews only having one ingredient, like beef ear, or beef pizzle. It never occurred to her that a deer chew would contain something other than deer. Luckily I didn't have any ill effects, but I won't risk chewing rawhide again. Mom will have to be even more careful when giving me chews. I'm sure if the deer chew had been properly labeled, it would not have been included in my box. I still love BarkBox, and trust them to provide quality treats. I am looking forward to sniffing what will be inside my December BarkBox! 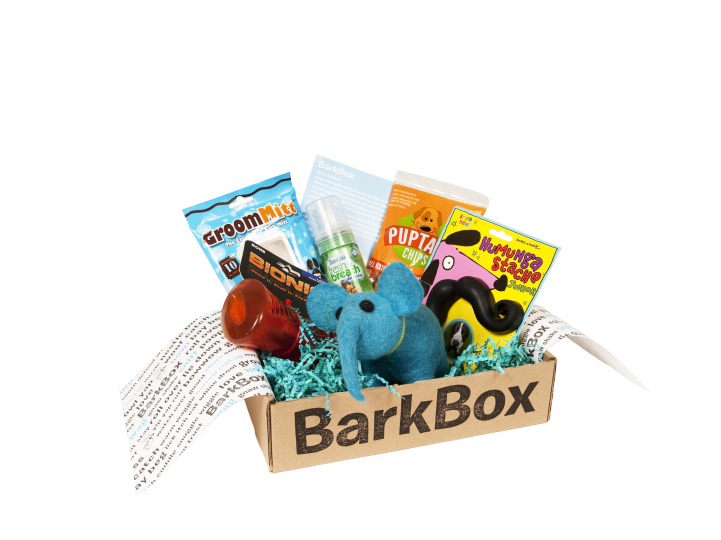 You know you want a BarkBox for Christmas! 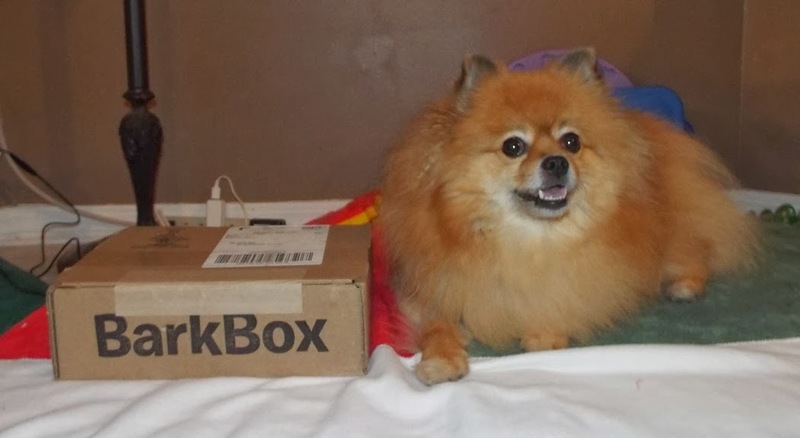 I realize that usually you need to order a BarkBox by the 10th to get it the same month, but (for this month only - December 2013) BarkBox is offering extended shipping dates - until December 17, 2013. There is a $5 surcharge for this option. Don't worry about the surcharge, I have a solution! 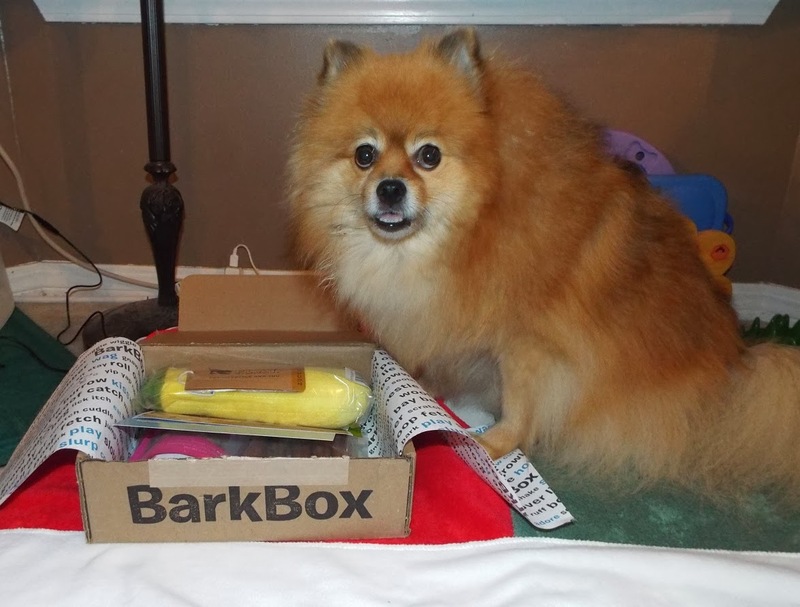 -----> Click this link to get $10 off your BarkBox Purchase! 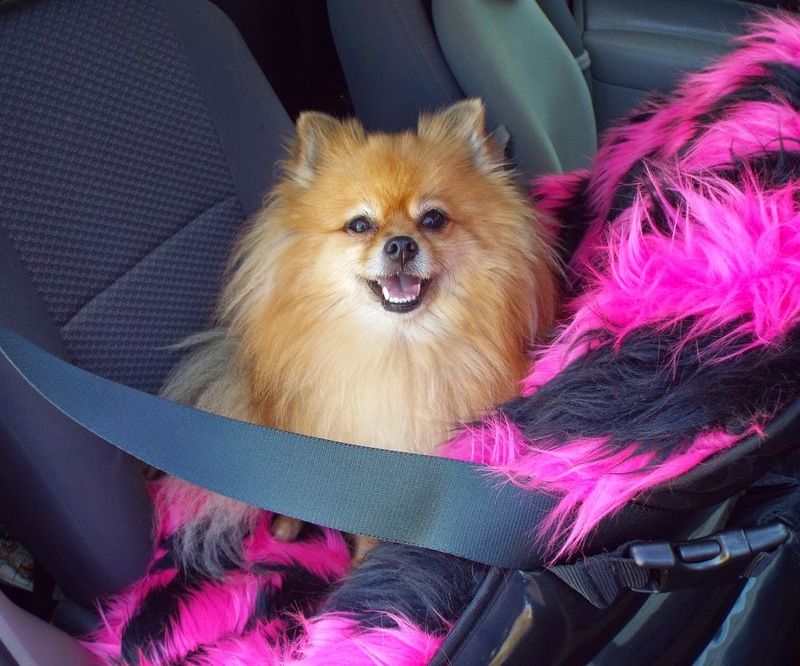 Disclosure: I have written this post on behalf of BlogPaws Pet Blogger Network for BarkBox. I am being compensated for helping spread the word about BarkBox, but Pepper's Paws only shares information we feel is relevant to our readers. How exciting to see what was in the small dog box Pepper! I love that Zucchini toy, it's too cute! Shiner's BarkBox toy was a big fleece thing that squeaks. It was lots of fun! I saw the photo of Shiner playing with her PetSafe Slap Happy! It looks like a pawsome toy! We have heard lots of good things about the bark boxes......but a couple of buddies mentioned that after about 6 months they start sending the same things....so we haven't tired them. But what you got sure does look great. Really? You are the first dogs that I've heard this from. I know there will be a really unique special treat in the January box, I saw it in a press release email. I may get a subscription to be sure I don't miss out on it! BOL! Wow, that is like a huge early Christmas...you are all set my friend! Woof! I agree Emma! Some lucky dogs get a box like this EVERY month! Pawsome! Mmmmmm, those Mac & Cheese biscuits are delicious! A crab sounds like fun! Do you bite his legs? Thanks for showing us what was in the Small & Cute BarkBox! We got those Mac n Cheese treats, too. Heather and Mr. K loved them! Much love, The Scottie Mom. High Paw! I notice most blog pals picked the big dog size box, even though they aren't all big dogs. We all THINK we are big! BOL! Sounds great to us, Pepper! You both would love a BarkBox! 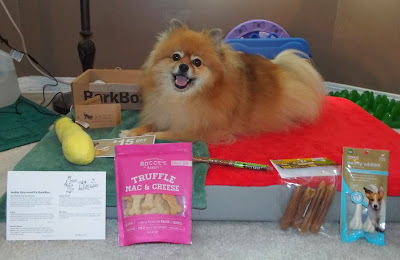 Excellent Blog Pepper about Bark Box and lots of goodies. Thank you! BarkBox is pawsome! My name is Tammy. I hope you don't mind me commenting on your blog. I just wasn't sure how else to reach you. I sincerely apologize if this comes across as spam, that is not the intent. With Christmas just around the corner, I thought you might be interested in our latest infographic "Are You A Doggie for Christmas Kind of Mom?". You can view it at Flickr.com: http://www.flickr.com/photos/106131018@N08/11241972855/ (Preview) . FYI (in case you're not familiar) Flickr.com is owned by Yahoo!. It's a very safe site and won't hurt your computer. To download the infographic right click on it and Flickr will show you some options. If you like this infographic and want to share it with your readers, please feel free to do so. 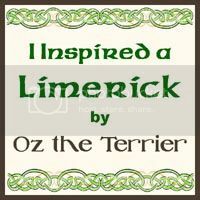 The only thing that we ask in return is that you link back to TheUncommonDog dot com in some way from your post. As a way of showing our appreciation to those who choose to share the infographic, I'd be happy to spread the word about the blog post by linking to it from our Facebook, Twitter, and Google+ pages. Just let me know that you posted it and send me the link. If you'd like to be removed from our contact list, please let me know.